Indonesia accounts for the most confirmed human H5N1 avian influenza (AI) cases and deaths in the world. At the epicenter of the AI outbreak since soon after its reported emergence in poultry in early 2004, Indonesia understands its need to expand its surveillance and response capabilities. Since its inception in August 2006, CBAIC worked with the Government of Indonesia and local partners to do just that. CBAIC expanded community-level capacity in animal and human surveillance and response to 27,000 villages across the western half of the country with the goal of reducing the risk of AI transmission to animals and humans, and ultimately, reduce the risk of pandemic influenza developing from deadly bird flu. Collaborate with U.S. Agency for International Development (USAID) AI partners including the Food and Agriculture Organization, the World Health Organization, the International Livestock Research Institute, the Ministry of Agriculture AI Campaign Management Unit (CMU), the Ministry of Health, and local government officials on sustainable risk reduction. Design and implement a community mobilization program to reduce the risk of AI transmission in West Java province. Find a commercial poultry partner to develop and test biosecurity advisory service models. Develop an integrated behavior change mass media campaign as follow-on to two previous campaigns. Trained and certified 80 master trainers, who in turn trained 1,753 volunteer subdistrict AI coordinators and 25,210 village AI coordinators in 124 districts across nine provinces in western Indonesia. This was accomplished through close collaboration with two local partners: Indonesian Red Cross and Muhammadiyah, whose existing community-based networks and resources facilitated training and dissemination of key messages to reduce the risk of AI transmission between animals and humans. Designed and implemented an integrated program of behavior change communications initiatives, to support the surveillance and response program. Initiatives included community events in high-risk areas, production and distribution of a variety of print materials, and a hard-hitting nationwide mass media campaign. The CBAIC commercial poultry private sector partnership program directly reached 250 commercial poultry farms in western Java Island with key biosecurity and flock management training to improve disease control and farm production. 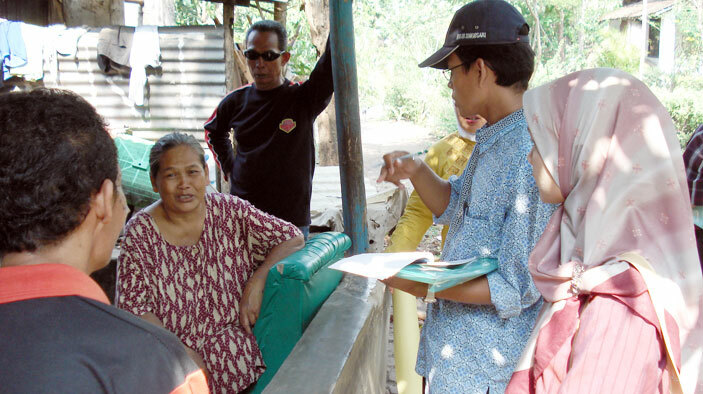 Designed and implemented intensive community mobilization activities in West Java province, include creating village AI teams, partnering with local markets, and training local public health cadres to increase hygiene and sanitation to reduce disease risk. By the end of 2009, these initiatives, along with supporting communication activities, such as community variety shows, directly reached 11,270 people in 1,000 villages.